Bleak as it may sometimes seem, it’s nice to know the world hasn’t lost its sense of humor. now i know i’ve been away from guam for too long for i can’t tell where this is at. I know that I won’t get any “Where am I” points, but that looks like behind GCIC. Right? What’s even more uplifting is that someone actually took the time to type it out and tape it on. first time commenting! you have a great blog. and games. lol. have you seen this one? it’s near las palmas. 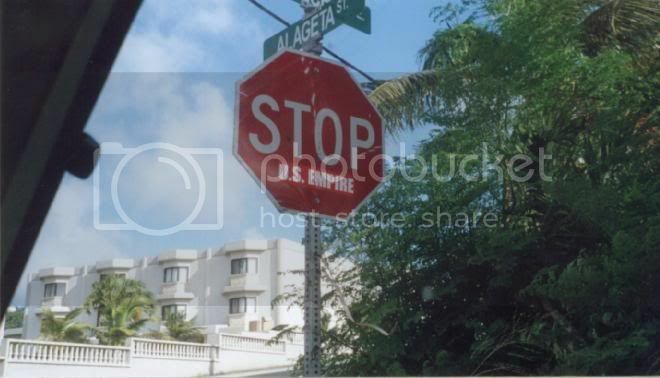 there is even one stop sign near gw/uog that used to say don’t stop. i wonder if there is a bus stop project going around, or if all these add-ons are just random. although i think it would be so much cooler if one anonymous bandit was driving around the island doing it.